www.airvoicewireless.com Airvoice GSM Pay As You Go Refills. If you "Like Us" on Facebook you might get your next order free! Guaranteed winner every day! Click on the FACEBOOK icon above now. 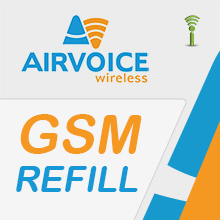 Airvoice GSM Pay As You Go Refills.